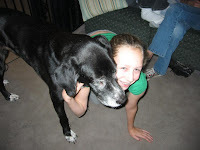 Looking back on 2008 I feel truly blessed. 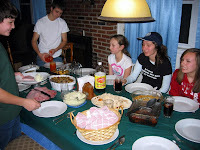 Not only do I have a wonderful and loving family, but our health is good, we have a roof over our heads and food on our table. Those last two things mean even more than usual given the state of the economy in 2008. I made many new friends this year. I made a lot of acquaintances too, but I'm talking friends here. These are the people that make a difference in your life. 2008 has been a banner year for making friends. You know who you are. It has also been an amazing year for keeping in touch with old and new friends. Between this blog (thanks again, Becky!) and facebook (thanks Elaine!) I have kept in touch with many friends and reconnected with several 'lost' ones. 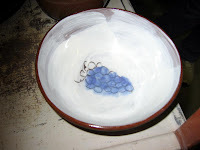 I have worked with stoneware and earthenware. Made terra sigillata from the parking lot at Clayworks, and made yellow spotted shino. 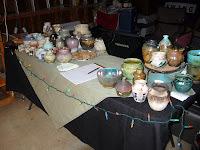 I have pinched and thrown pots, decorated pots with slips, glazes, and stains. Worked out a new (for me) type of hollow, flanged lid that is thrown right-side up off the hump. I have fired cone 10 reduction, cone 5 oxidation, raku, saggar, and fired in a barrel. 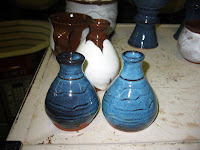 I have thrown some small pots, some large pots, and all the sizes in between. I have attended my first three workshops (Peter Rose, Peter Lenzo, and Tomoo Kitamura) and they were wonderful. One of the biggest accomplishments I made this year in clay was to get serious about it. After sixteen years I have started really paying attention to what I am doing and why I am doing it. 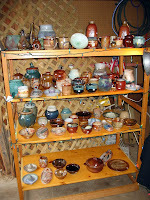 I have looked at more great pottery online and in person in 2008 than I have probably seen in the last decade. The blogosphere has made a huge impact on that. If you'd like to know where I get a lot of my inspiration, check out the blog roll on the right. These folks are for lack of a better, more dramatic term, amazing. A lot of thanks go to my good friend and teacher, Greg. He has shared some of his wonderful insights on the nature of art and pottery that have kick-started my journey of discovery. I am seeing lines and forms and gestures in a way I never realized was possible. I am thinking about things around me in a whole different light. I'm noticing things. It has truly been an inspiring year. 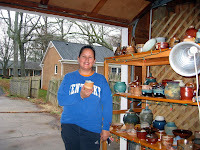 In 2009 I am looking forward to pushing my pottery to new and different places. 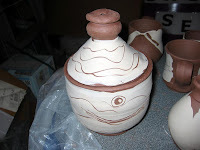 I am hoping to do more raku, concentrate on form and decorating more, and even slip a couple of pieces into a salt kiln. I'm hoping that 2009 will take my journey ever onward and upward to new heights I currently don't even know exist. Here's hoping that 2008 was good to you and 2009 challenges you and takes you to places you never thought possible. May we all continue to live in interesting times. 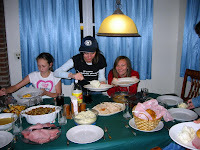 I'm sure the ritual of eating together has deep roots in our psyches. It fires off anchors from pre-history that we can't even begin to recognize on a conscious level. The first cave people that lived as an extended family or tribe probably felt the same comfort in the process. 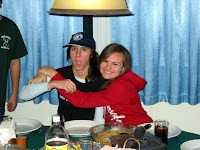 Oh, and when you're teenagers eating with your cousins it can be a lot of fun as well. 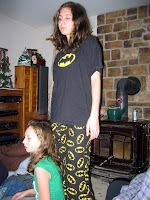 With teenagers it's all about fun, food, and sleep, in any order at any time. At any hour one parent can ask the other, "Are they eating again? ", and be answered, "Not 'again', STILL. "* It's a cause for celebration, especially when you're lucky enough to have family present. *Actual conversation between my father and mother when I was a teenager. It's still the holidays around here and that means it's kids' time. The kids are enjoying their holidays and time off from school. There's always something going on and usually a lot of giggling. Meredith got her for Christmas. 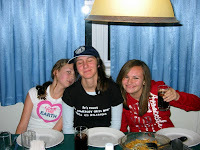 (Cousin) Audrey, Stephanie, and Meredith. 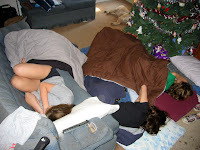 Teenagers always get to sleep in. If there is one thing about my life I would like to change, it would be my proclivity for procrastination. I'm going to work on removing it from my life --someday. 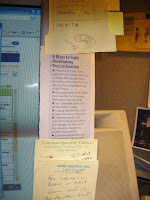 As you can see from the photo below, this article on procrastination was clipped from the newspaper, taped to my monitor and buried in (now ancient) post-it notes. I could write a book on the subject, if I could just get around to it. I once left a catalog opened to a book on procrastination on my desk for more than a year. The company the catalog came from went out of business before I got around to ordering the book. In the long run, it probably saved me money. I didn't buy the book that I was never going to read anyway. Get ready. There are a lot (ten, count 'em!) of posts here since my computer was down. If you want to catch up on them all, you will have to go to 'older posts' at the bottom of the page. Christmas at our house is exciting for everyone, but especially Binkley. He runs around like a nut because he knows he's going to get a gift. 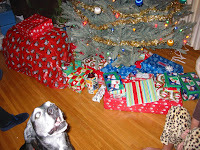 It's amazing how he remembers it when we only do the gift opening in the living room once a year. He's right in your face until he get's his treat and once he does, he has to prance back and forth through the room with it for twenty minutes before settling down to eat it. All the prancing disrupts the humans opening their presents (it's pretty tight in the living room, what with the tree and all). Oh, and did I mention that during the prancing everyone's feet are fair game? Even slippers don't protect you from him. After opening the gifts I went to the kitchen to cook pancakes and bacon. 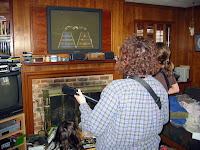 Once that was cleaned up, Karen and the girls went to the den to check out the new Wii games that Santa brought. I secluded myself in my office to try and resurrect my computer. (Good news: I'm typing on it right now!). It was a good, relaxing Christmas. I hope everyone else had one too. 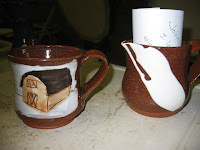 Here are some of my earthenware pots that came out of Greg's firing. I tried some slip work and used some hare's fur blue. I will experiment with this some more in the near future. 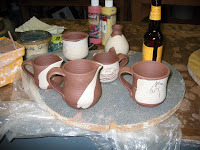 I promised pics of Greg's finished pots and here are some of them from 12/24. I stopped by the studio to pick up my work and check out his. Great stuff. It's all a canvas. My neighbors have some geese that they use to decorate the yard for Christmas. While they were out of town last weekend their son and his friend decided to change the tone of the Christmas display by hanging one of the geese in their tree. I don't think he has any issues with Canadians, but if you're plastic I guess you'd better watch out. I like the brick. It makes it more of a science project and less of an act of ornamental violence. You just never know who's lurking around your neighborhood, or even your house! My friend Pam slipped these home made candies into our mailbox with our mail. Getting bills never tasted so good. There was a time that Pam and I would try to get together before the holidays and make some candy. She's an excellent all around cook, but in high school she worked in a shop where they made candy daily. I always have to stop and absorb that fact. She worked in a shop where they made candy daily. That's like God's own work. Anyway, now back to today's story: Not only did she sneak about making candy without me, but she sneaked over to our house and placed said candy in said mailbox. Thank you Pam! It's wonderful! Pam and I have some fun stories about making candy and one time we even made blackberry jelly from blackberries we picked. These are all due to Pam's expertise --I was always the student. Maybe someday I will share some of them of those stories with you. Slipping and glazing at the studio with Greg. 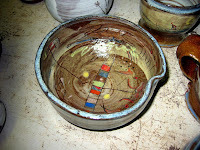 I just had to capture some of Greg's earthenware pieces on silicon (hmm... used to be 'on film'). He really does approach each piece as a canvas. 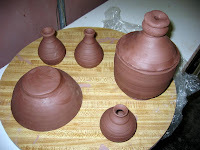 Look for the finished pots in a later post. Nice, huh? I now own one from the previous firing and I will post it as soon as I can. Everyone in our household is getting into the spirit. as long as it's on her tv. Binkley is always excited about anything. Check out Gary's work and really fun blog. 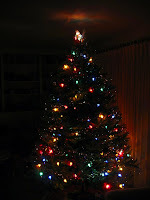 Here's our Christmas tree as it streaked through the living room. It moves really quickly, just like the holiday season. Just when you realize it's Labor Day, you turn around and another President's Day is in the history books. It's like the earth is revolving faster and faster on it's axis and we're lucky if we can catch Christmas like a brass ring on a carousel. It sure explains my dizziness. almost looks like it's standing still. I turned on the flash and grabbed this rare glimpse but it scared the tree so badly it spent the next three hours hiding under the dining room table. My hard drive crashed at about 2:30 am on 12/24 and I spent until ~4:00 am trying to "Lazarus" it. No go. Being the computer professional that I am, I didn't have most of the info on the drive backed up even though I browbeat all my customers to religiously backup their data. "Do as I say, not as I do..."
I ran out to Best Buy on 12/24 at 4:35 pm (the store was closing at 5:00) and picked up a 500gb drive to replace the 250gb failed unit. Today I installed the new drive with the restoration disks which brought it back to the way it was when I purchased the computer in December of 2006. Once I had the machine back up and running I installed the old drive as a secondary and (whew!) most of the info was accessible! It's truly a Christmas miracle. I will probably be working on it for another month. I have NO idea why blogger is putting such a space between the title of the recipe and the table I created, but here it is. * ~2 C. liquid measure = ~12oz pkg of chips. raisins, add them last or they'll not mix well. they could take up to 25 minutes. Makes about 4 dozen "regular sized" cookies. Amy, Nick, Minke, Becky and Kim. You can check out more about it from Amy and Becky. Animated Christmas light display using over 30,000 LED and 400 strobe lights. Display is animated with 176 channels. Music is broadcast over short range FM so viewers don't need to leave the vehicle to hear the music. Near the end of my Christmas sale I was pleasantly surprised when Amy stopped by just as I was reading her posting on facebook. I mean I was actually reading facebook on my notebook computer and I looked up to see her walking down my driveway. How cool is that? We talked about a lot of things, not the least of which was the fact that she has already sold something in her Etsy store. Cool, eh? Thank you so much for coming by, Amy! 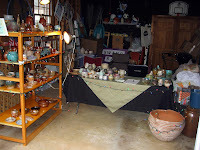 Question: If you hold a pottery sale in the garage and nobody comes does it still make a sound? Answer: Yes, mostly the sound of leaf blowers. I don't know what I was thinking. It's less than a week (and the last weekend) before Christmas. People are busy doing whatever they're doing. (Seems like mostly leaf removal.) A lot of people have probably left town for the week, and most sane people have already finished their shopping. I was just so buoyed by the response I had last weekend with no postcards or emails (again, duh) that I thought this weekend would be better. 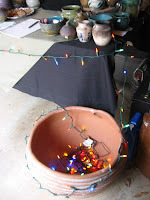 Oh well, I need to start thinking about a spring sale when a young man's thoughts (and mine too) turn to pots. Everyone who does come by loves my work, so I'm feeling good about that. Thank you, everyone for your kind words. They really do mean a lot to me. 10:00 am, 11:00 am, etc. 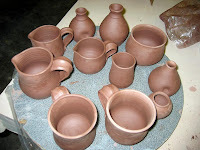 Friday night I met Greg at Clayworks to get some of my earthenware pots into his bisque kiln. 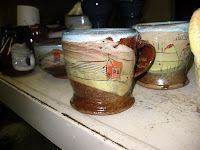 I slipped some of them and did some sgraffito on some of them. 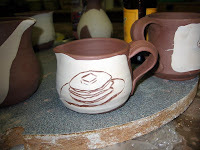 I don't have pictures of all of them since I rushed to get some of them into the kiln before Greg closed the lid. I also learned the hard way what Ron, Doug, and Hannah talk about when pouring slip --it can make the pot really soft and start eroding it away. Lesson learned. When I got there Nick was furiously working on his wonderful planters and he stayed way too late as he left with me (and we all know how late that can be). 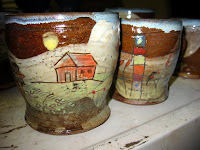 Some slipped and sgraffitoed pots. This would be a syrup warmer. ... just a couple of pounds at a time. 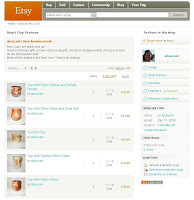 Amy Huacani has opened a new Etsy shop here. Check it out. Ron Philbeck has had an Etsy shop for a while. You can find it here. Visit them often and shop them even more often. since it was foggy again. I went in to the studio Wednesday night and worked with the rest of the bag of earthen red. 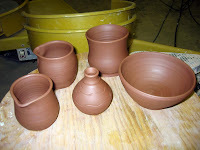 I also trimmed the bottoms and handled the pots I made on Tuesday. 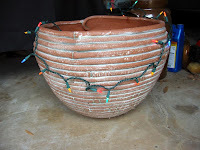 I have given up trying to fire the pots before Saturday, but maybe they will be done before Christmas. 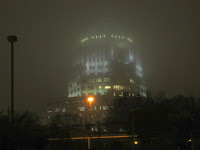 It was foggy again on Wednesday night. because it looked the same. When I got to Clayworks on Tuesday, it was getting foggy downtown again. I'm starting to think we live in London. Amy, Becky, Mitch and Nick were working when I arrived and we enjoyed some lively conversation about pottery, movies, and music. As usual, I was the last to get there and the last to leave. When Greg and I talked about getting one more cone 6 firing completed before Christmas, he mentioned that he was working with Earthen Red clay so I thought I would give it a try. It was a revelation. It seemed smoother than porcelain and I really enjoyed working with it. So much that I made sixteen pots and one lid (not pictured) off the hump in about three hours and almost finished a new bag of clay. Woo-hoo! Detail of some reed infusers. "I feel the earth move under my hands..."